La Baou de Saint-Jeannet is a steep-sided rocky projection of the mountain chain above the hilly countryside of Vence, whose outline gives the lovely landscape a touch of drama. At its foot nestles the little village of Saint-Jeannet, which, like all the little mountain eyries of the district, threatened for centuries by marauding Saracen pirates, is a walled settlement with a church tower like a fortress in the middle. In the evening light the little citadel against the dusky hillside, under the protection of the mighty guardian mountain, seems a comforting place of refuge. Chagall had stayed there for the month of October 1949, and after he began to live in Vence in 1950 he had this scene constantly before his eyes during his daily strolls. Slowly, very slowly - as is customary with him - it sank deep into his mind. The poetic counterimage in response to an optical experience emerges for him only through the filter of memory, and so, during the early years in Vence, it was the fantastic town views of Paris which first materialized. It was not until 1952 - beginning with the Vence: Night, which was not actually finished until 1956 - that his new surroundings, which had become home to him, began to invade his imagination. Since then a whole series of pictures has come into being, weaving a web of highly poetic inventions around Vence, like those once woven around Vitebsk and Paris. In 1958, there was a picture with the title Saint-Jeannet, although it was not completed before 1960. But the mountain was not shown in it, only the abbreviated town view before the curve of a hill within a wide landscape, in which a horse perched in a tree is admiring a floating flower girl, while a shepherdess with a sheaf on her head walks across the bright sky. Then in 1967 came a picture called Saint-Jeannet la nuit. Here, in nocturnal blue, one sees a steep hillside plunging down like an avalanche, with the village embedded in it like a small spot of safety. In front of this, in red outline, is a peasant girl with a laden pack animal, suggesting the pastoral motif again, like the faint echo of a remembrance of Greece. 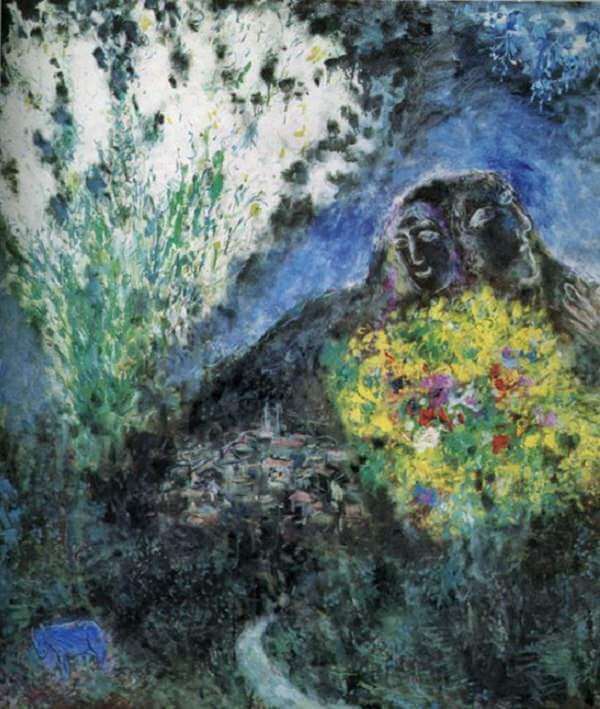 Finally, in 1969, Chagall painted La Baou de Saint-Jeannet, the "most realistic" of the whole set. It shows the characteristic outline of the craggy mountain and a view of the village, like the abbreviated medieval representations of towns. Looking out between two bunches of flowers, one could really see the village like that from Vence, in the nighttime light. But from Chagall's new house, in the little woods near Saint-Paul, the Baou de Saint-Jeannet was no longer visible. Thus the picture was done from memory, in which reality and dream become fused and the sense of one's nearness to things becomes clearer. This creates the "realism" of the picture.